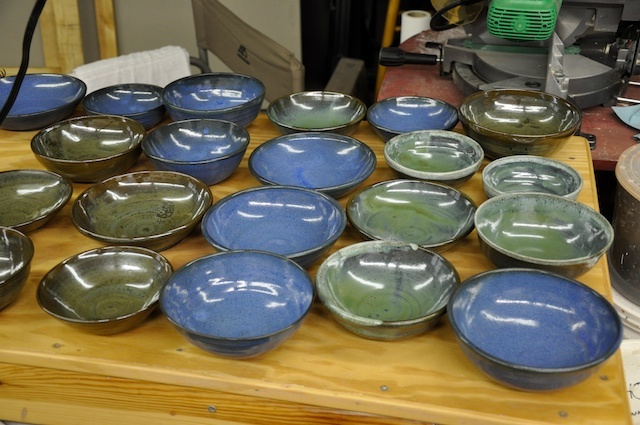 This year’s King’s Cup 8 winners will be taking home, among other fabulous prizes, Barley Hollow bowls. In the past, I’ve made mugs for prizes. This time around, at the suggestion of a buddy, we’re doing bowls. I made a lot – about 38 – in hopes that a sufficient number would be suitable for prizes. Most of them will work! There are a few with little issues that I’m uncomfortable releasing. I wouldn’t sell them, so I’m not giving them as prizes. And there were a few in the group that worked out really well. Also in this cycle were some really big mugs Mike requested. I hope these are big enough. If they’re not, I think I’ll have to learn to throw buckets. Another bigger item in this firing is the butter dish. I made 8 and this time they’re long enough! Yay! More butter dishes. The albany slip on the dark clay was especially striking. The art deco green didn’t have anything to break on, but still yeilded an interesting satiny finish, something more like pewter with a hint of green. 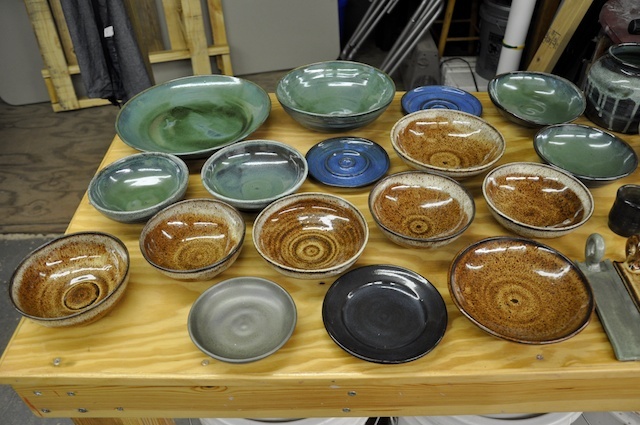 There were a couple +14″ chargers still waiting for kiln space. I’ll fire them next week after all the hub-bub. For now, the King’s Cup bowls are the big deal. And I’m happy they finished in time. UPDATE: Yesterday was the final day of the King’s Cup, and we awarded 27 of the bowls to the top 3 places in each division. Everyone got to pick their own. I hope everyone enjoys their bowls. It’s always interesting to see what gets picked and what gets left behind. Some that I really liked were among the last to go or are still in the studio. This just helps me keep in mind that making a lot of different pieces with their own personality is a good thing. Now, it’s time to get back making more pottery! Cheers. missing you at Farmer’s Market. Ever going to attend? Love your stuff! Did you take any more welding classes? Thanks Laura! I’m hoping to be back at the Farmer’s Market in June. Slowly accumulating enough ware to make it worthwhile. Some fun pieces are waiting in the bins now. Thanks Richard! I was pretty happy with the results from this firing. And I finally got the butter dish length worked out for my clay body. No more butter “hangovers”. Thanks for continuing to read the blog! They look great, Joel. Looking forward to more art deco green pieces; it looked especially good on the cable-keeper, so maybe vertical pieces. Thanks. I really like the art deco green, too and want to test it in combinations and on more heavily textured surfaces. Definitely more of it on the way. 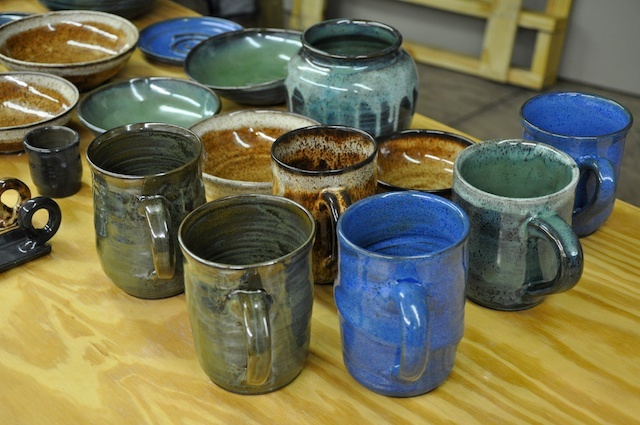 And I should soon have a couple new glazes in production. They’re almost ready. Check back for details. As always love your work. I really love the black clay with the glazes very nice. I’m having a lot of fun with the dark clay. It does bring some pleasant surprises to old dependable glazes. 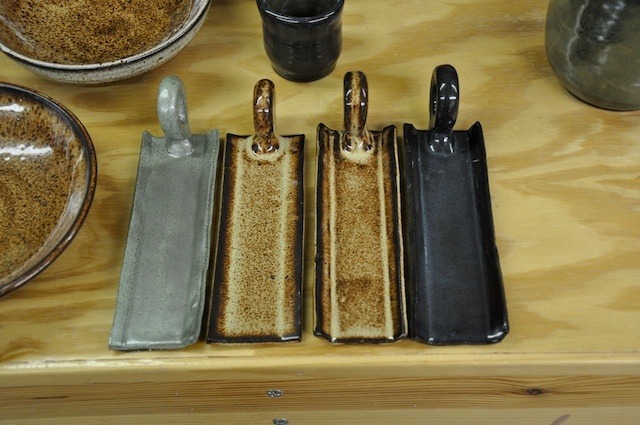 Especially interesting rim contrasts when the glaze thins. I’m glad you like them. Thanks!